Architecture and home design play a larger role in our lives than we most likely realize. From the brick clad buildings we pass on our daily commute to the pleasant interiors we spend our downtime in, each space plays an important role in how we experience the world around us. It should come as no surprise that home design and how it effects a clients life is a passion for many in the construction industry. More than just for cosmetic appeal the structure and layout of a home defines the homeowner and their lifestyle. This article will discuss Modern Home Design Ideas and what makes them stand apart from more conventional home design in NJ. Here we’ll look at an exquisite modern home design and talk about what makes a modern home so special. What makes a modern home design stand above most other home designs in NJ is an intelligent use of space. Not only does this home look beautiful while comfortable, it also provides the homeowners with an amazing experience by creating an indoor outdoor design element that makes you feel as if you’re vacationing at home. We’ll also discuss some other features of a modern home design hat sets it apart from a more conventionally designed home in NJ. What makes these homes special. And why you should consider a modern home design for your next new home. We love how you can look into each bright and colorful room. Our favorite part? The 30+ foot long wall of sliding glass doors that open the entire studio to the pool deck and patio. Can’t you just imagine weekend after weekend of pool parties here? Tons of glass is a staple of any modern home design as well as fantastic indoor outdoor elements. A great modern home design creates a seamless flow from inside to out with outdoor spaces integrated into the design. Outdoor entertaining areas are a must. Maximizing your view with glass or wire railings is also a staple of modern home design. When considering modern home design ideas for your next project make sure to incorporate lots of glass into your designs. Another nice benefit of glass is fresh air. A modern home with plenty of windows allows for tons of cool fresh air in the spring and summer while letting in ample amounts of sunlight to keep the house warm in winter and fall. New window and door glass is well insulated so your not losing much R Value compared to insulated walls. Another staple of a great modern home design is the use of natural building materials. Ipe is a fantastic building material for both siding and decking as well as other accent pieces. Other types of composite decking works as well as long as it is good quality and has a natural grain color and feel to it. Generally stay away from decking that has a solid color as it tends to look plastic, unless that’s the effect your going for. Make sure to install your decking with clips or some other hidden fastener like Camo screws to avoid seeing screws. And get the longest boards they sell to avoid seams wherever possible. Of all the modern home design ideas and tips we have this one may be the easiest. If your going to pick materials anyway think about incorporating more organic, natural elements into the design. Put the decking at the level of the interior floor if you can to create a seamless flow inside to out. Glass or wire rails are a great addition to any modern deck as they maximize your view while keeping you safe from falls. Coordinate your outdoor color scheme with what you have inside. Notice in this design the Ipe decking matches the siding with only a difference in shade. These natural colors compliment the furniture both inside and out. Great use of neutral earthy colors with splashes of vibrant color. Of all the modern home ideas and tips we have this one has to be planned for at the very start. Some of the others you can add later but you really do have to plan for a flat roof since the entire structure is designed to support it. A must have for any modern home design. Contemporary homes are pretty much the only type that uses them and are pretty much a given if your going modern. A flat roof is a beautiful design element when used correctly and every bit as strong and reliable as the more commonly used sloped roof. Flat roofs also offer the advantage of additional entertaining space. Although not done in this homes design, it’s very easy to add a rooftop deck with a flat roof since it’s already flat. This is a much harder feature to add onto a more traditional home design since the roof is sloped. If you live on the water it’s definitely something you should consider as the higher you go the better your view becomes. Modern Homes have been called “a spatial experience that excites the senses by promoting light”. This applies to lighting both inside and out. An average home designed for the Jersey Shore doesn’t have much exterior lighting. Generally there’s porch lights, something by the garage and some motion lights but that’s about it. 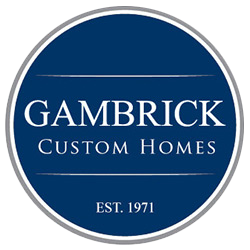 At Gambrick we always recommend clients spend more time considering exterior lighting as much as they do the interior. Of all the modern home design ideas we have ample lighting is one of the easiest to incorporate into any design. It really makes a huge difference when a house is not only well lit but also lit in the right places and in the right ways. There’s a lot more to designing great looking exterior lighting than just putting a bunch of lights around the house. Modern home design takes this into consideration by incorporating exterior lighting into the overall home design from the very beginning. We use lighting as a design element to showcase specific places and angles of the home turning those spots into real showpieces. Look at the entry shown above as a perfect example. The 3 small LED recessed lights provide plenty of light while drawing the eye towards the beautiful custom made wood soffet and Ipe porch. Step lights are placed along the stair edge to not only provide added safety at night but showcase the custom built Ipe and Azek stairs. Interior lights shine through to further light up the porch and draw people in, creating a warm and welcoming entry. 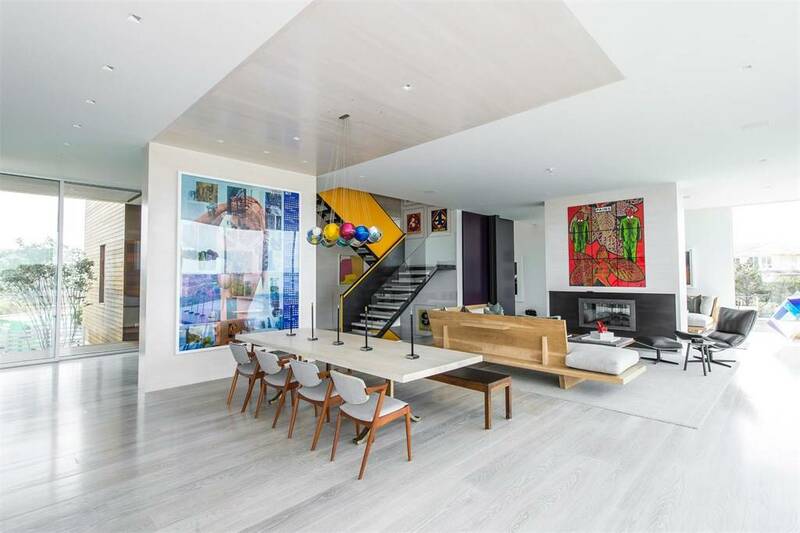 An open floor plan is one of the tenets of a great modern home design and one of our favorite modern home design ideas. The entire structure of the home is designed to allow for large open areas that flow together from room to room with little to no obstruction. 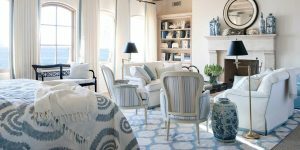 Clean neutral colors are used throughout the home which allows for strategic splashes of color wherever the clients sees fit. Using muted colors provides an amazingly blank canvas for each homeowner to define the style and feel of the home and truly make it their own. Most other homes are defined by wall colors and trim styles. Modern Homes are cleaner. Their true beauty lies in their minimalism. No other home provides an opportunity for clients to express themselves and their style like a Modern one does. When considering modern home design ideas you have to think about the open floor plan and how you’ll work your personal style into the overall design. Optimizing floor space with an open floor plan is one of the most functional of all modern home design ideas. Check out the shelves strategically built into the sides of this wall. Structurally speaking the wall doesn’t have to be there. The designers put it there for a reason. Like everything in a well designed modern home this wall serves a purpose. The clients wanted a separate seating area with a gas fireplace and entertainment center as well as another seating area for a TV. They asked for built in shelves to eliminate excess furniture and clutter and since most exterior walls are glass they didn’t want to block the view with a bookcase or other shelving. Because of all these needs the architects designed the wall you see above. All the clients wishes are met with a single clean yet elegantly simple wall. That’s the heart of a well designed modern home. Simple, clean, elegant yet functional home design. The master bedroom doesn’t have to be gigantic to make a bold statement. Most new homes at the Jersey Shore are all about square footage. You know your in the master because it’s huge. You can have a big master bedroom with a modern home design too, but it doesn’t have to be extra large to be spectacular. 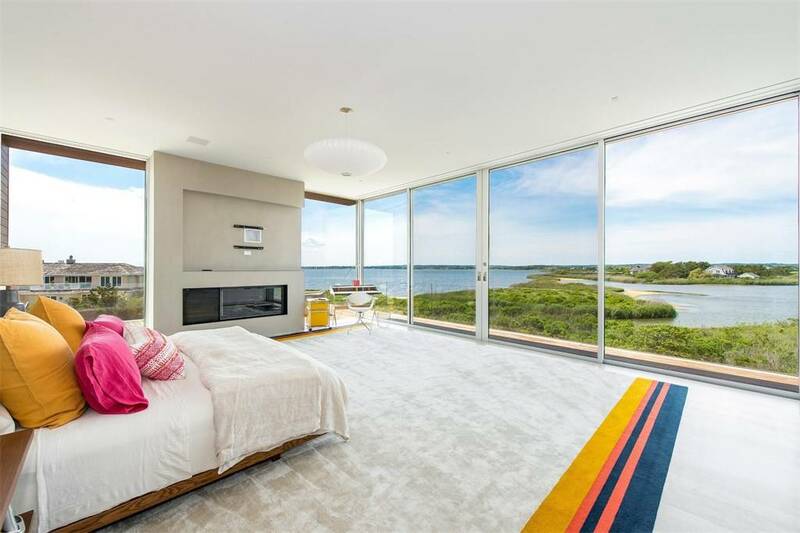 Glass walls with an 8 ft. center sliding door leading to a private Ipe balcony overlooking the Navasink River is what I call a Master Bedroom. Walls of glass are one of our favorite modern home design ideas and luckily for us one of the most commonly used. A single wall houses the TV and built in gas fireplace. Neutral carpeting with great use of bold bright colors. 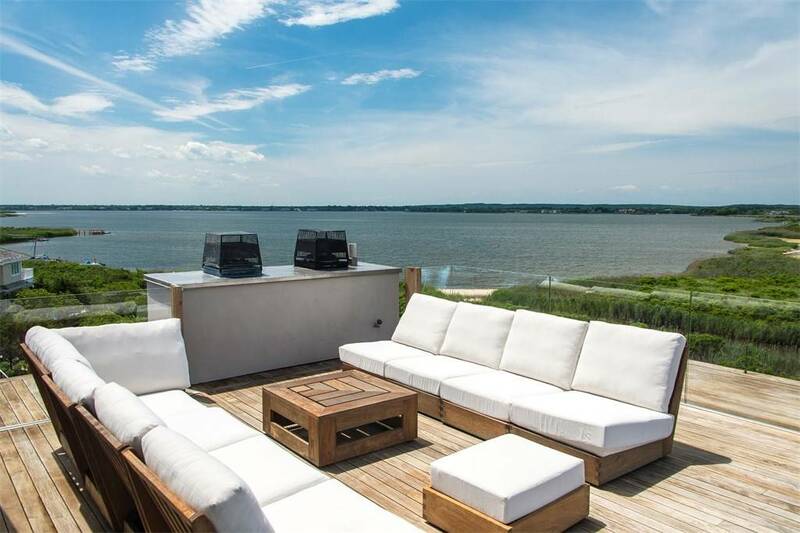 The best modern home design ideas flawlessly incorporate the use of outdoor living spaces. Check out this beautiful Ipe deck with wood and white cushion patio furniture. Fire feature with glass railings. Feeling like your on vacation while at home is one of the many benefits of a modern home design. Remember when designing your next outdoor living space that they call it indoor / outdoor living for a reason. The two spaces should flow effortlessly between one another. Using bold colors along with a neutral overall color palette is one of the tenets of a modern home design and one of our favorite modern home design ideas. The home featured above is the perfect example. 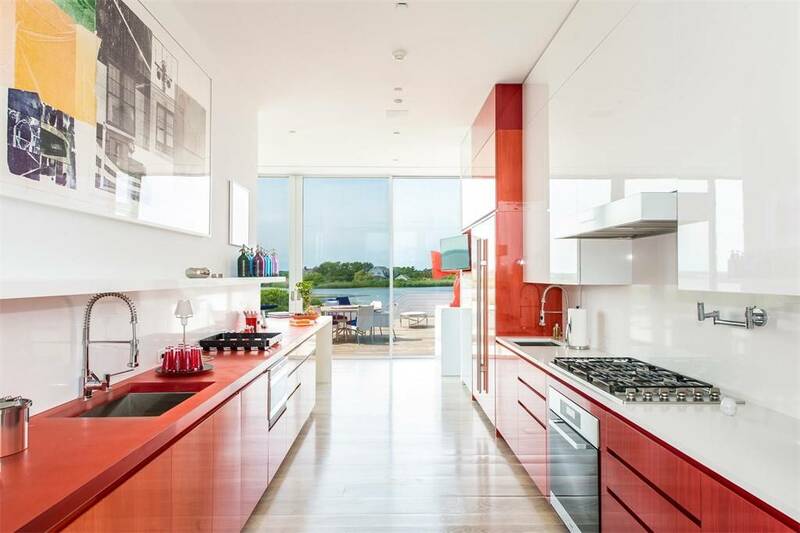 Light wood floors with white walls and ceiling accentuated by vibrant artwork and bright, bold red cabinets. Red and white countertops. Red appliances. You don’t see the use of color like this in any other home design. Modern homes are a celebration of color, using a much broader, brighter color palette than a conventional home would ever dare to use. No one visits a modern home and says it’s boring. 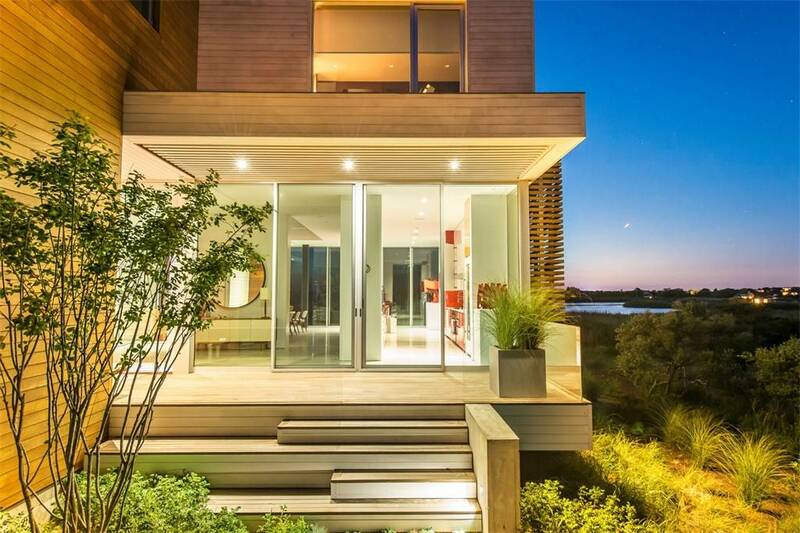 A modern home design can be a real piece of architectural art, especially at the Jersey Shore. Homes like these make up less than 1% of the total homes built in NJ so if your thinking of building a modern home take the extra time needed in the design phase because you have a rare opportunity to build something truly special. As a top rated Custom New Home Builder in NJ for over 40 years we have the experience and expertise to handle any size project. We’ve built and renovated hundreds of custom new homes at the Jersey Shore serving Ocean and Monmouth County, NJ. If your thinking about building a new home or have any other construction related questions send us an Email or call (732) 892-1386 for a Free Consultation and Estimate.